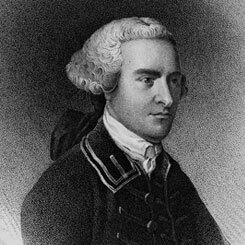 Image courtesy of Library of Congress A lifetime public servant, John Hancock of Massachusetts served as President of the Continental Congress from 1775 to 1777, and again from 1785 to 1786. On this date, the Continental Congress adopted a plan for the inaugural national government under the Articles of Confederation. Two days later, the Continental Congress sent the Articles to the states, which approved the new government in March 1781. Created to unify the 13 colonies, the Articles nevertheless established a largely decentralized government that vested most power in the states and in the national legislature. Concerned with the accumulation of power in too few hands, the Articles did not establish an executive branch and they greatly circumscribed the role of courts. Even Congress had only those powers “expressly delegated” to it by the states. Delegates gave the Continental Congress the power to request money from the states and make appropriations, regulating the armed forces, appointing civil servants, and declaring war. But the legislature was largely ineffectual because the Articles required more than a simple majority to pass legislation that related to such fundamental issues such as finance, taxation, treaty ratification, and war-making powers. Moreover, attempts to strengthen the Articles required unanimous support of the states. In 1787, the Federal Convention approved the U.S. Constitution which, when ratified by the states, superseded the Articles of Confederation. The Constitution provides for proportional representation in the U.S. House of Representatives and the seats in the House are apportioned based on state population.